Become a Reina de Santiago ® ambassador. Tell your friends you about Reina de Santiago® and receive complimentary gifts. When friends to whom you recommended Reina de Santiago® purchase an item, you as the recommender are rewarded. When 10 items are bought, you will receive a complimentary garment. Do spread the word, the more friends you tell, the sooner you will receive your complementary garment. Don't forget to tell your friends to mention your name when they make their purchase. Ladies who do lunch! Gather some work colleagues together over lunch while we present the collection. Alternatively Invite your friends to an ambassador evening at your home. 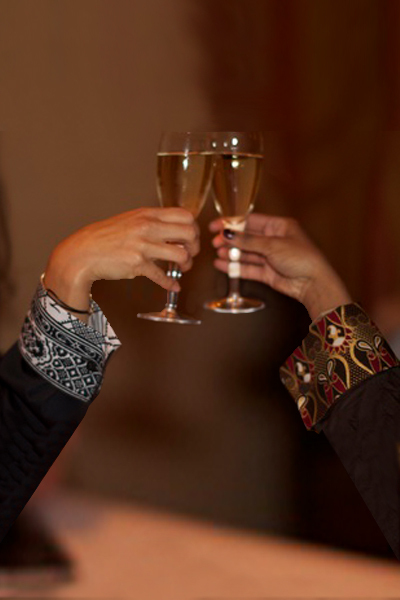 We will provide complimentary drinks* The hostess receives a complimentary garment if more than 15 garments are sold.